Today is the last day…the end….put a fork in it cause it’s done…2013. If there be any day…besides Thanksgiving (but most of that day is a time of preparing this humungous bird) to give thanks…it is today. When I think back on my year of 2013, the topography of that vision is like the Appalachian Mountains, spiked with highs and lows. Peaks that brought that “I’m the king of the world” and lows that still strike a chord of deep pain in my soul. I like to start with the bitter…which dates back to my childhood…of this I am sure. I am NOT a cooked vegetable eater…at all. Okay, I like corn, but I have told that is a starch and not of the vegetable family…poor corn getting the ax. Oh and sauerkraut…go figure..one of the most pungent of all veggies and I LOVE IT! We were not allowed to leave the table before eating all our vegetables… I truly believe my mom tried every kind under the sun…so I would make sure to save a bite of something I did like to take away the taste of what I didn’t. So so true of my life in general….I need something…a reminder of the good…to take away the sting of the not so good. This year has been marked with lives lost….funerals attended that reminded me how precious life truly is. It felt like we were all reeling from one to the next…reality that we have no guarantees in life…no one escapes car crashes or cancer. I saw stunned faces, vacant eyes, grief that overtook simple joy…and in places that I wish we had the answer to the whys..but we don’t. Just the Who…the One that holds it all in His hand. What I also saw though in the bleakness is the human desire to comfort each other. Our inborn need to help…to reach out and soothe…bring food….run errands….simply “be” for others when they are unable to “be” for themselves. My dad’s stroke rocked the foundation of what I never saw coming. A man who raised five kids…hello, that is worth some sort of award…worked to support his family…and then came home to fix whatever was broken. This event rocked us all…my siblings…my own kids….to our core. Sure we all know our dad/grandpa/great grandpa is 83…but none of us were ready to see him diminished…seeing the war inside himself…to force words that he wants to say…try to make a hand work like it used to….to be in the limbo of “what is next.” Behind the clouds comes the sun…that gives this beautiful silver lining…the spot we turn our eyes towards. We come home…not to our own occupied houses…or the one we grew up it…but to the place that we find them. Like it or not, my parents have had visitors…their children…come down…spend time…hear my Dad’s laugh….to ease our own fears. To remind them that they raised their kids…and it is our time to give back….as much as they will let us. My speakable joys are pretty transparent…so very rich and plentiful. My daughter Amanda Kay moved back to my neck of the woods. When she said that she was ready to move on to another chapter in her life, my deep fear was it would be far far away from me. My prayer time was like a bargaining table at times until I realized that I truly do not hold the cards…so I prepared myself instead for what may be. When the job came up in Houston I did a happy dance…thank goodness no one saw…it was bad…and gave ultimate thanks to God. She lives close enough to meet for lunch…or dinner…no breakfast since she is NOT her mothers daughter when it comes to mornings…shopping…a movie…or simply let’s meet and do nothing. There is no greater joy then to have part of your heart return. I have watched my son grow into this amazing man of God that truly humbles me. His words are ones I wished I thought of first…his wisdom and deep seeded faith far surpasses my own. When Doug married Lianne I had two fears…one that I was losing my son…and two that I would struggle to love Lianne like I love my two children that I bore. I think God took great delight in showing me different. The love that has come from their marriage has only enriched my relationship as Doug’s mom…and when I think of how many children I have, it is an automatic THREE now…with Lianne being grafted in so easily and completely. My instant put-a-smile-on-my-face joys are my siblings…who hold a place in the storehouse of memories that solidify our future of making more. My friends who only reinforce a quote I once read by Walt Whitman: “I no doubt deserved my enemies, but I don’t believe I deserved my friends.” God apparently sees the need to surround me with love and support and I am grateful…always. I work at a church that sees the need to serve God…and being a part of it humbles me. Each day is a choice…so I will live it as such…so that I may encourage…and love….just as the Father has done for me. This Texas weather waxes hot then cold worse than my first boyfriend. Fickle, I tell ya. It made it hard to get in the holiday mood, too. Hung lights in my shorts one day………a ninja-styled parka the next. My closet is in ruins. I want to put the summer stuff to the back, but I hate being hot. I’m not one of those blessed souls that can run around in a turtleneck in 70 degree weather …. looking like a fall fashion magazine. I want to be clear – I’m not against the heat nor the cold. I’m an equal weather opportunity gal. I just need you to make up my mind already. I have no patience for the temperate mood swings of our great state. Although, judging from the long lines at the car wash, most of you were less enthused with your “Made in Mexico” holiday gift. Why bring all this up? I suppose because it’s made me moody. I’ve allowed the shifting weather to play havoc with my emotions. Up one moment down the next. When it’s cold it just feels like Christmas. And let’s face it…… It’s easier to make up your mind to do something when you feel like it. On the days the weather was chilly…..the fire was lit, gingerbread was architecturally crafted, cookies were baked, trees were laden with sentiment and the whole house got a garland-lit face lift. Basically, If it stood still long enough…..It got decorated. Sadly, on the warm, moist days I was much less motivated. (I did mention that I don’t like to be hot.) I refuse to turn on the air in the middle of December just to run the oven or work up a sweat. If I explore this idea of living by feelings, I find God has much to say on the issue. Most of us have heard the latter part of this scripture and possibly have it inscribed somewhere in our home. But have you ever wondered about the first part? It seems like a risky choice to me that Joshua called the Israelites out and gives them the choice to serve other gods. I have never heard a sermon like that from the pulpit. Yet as I consider the wisdom of such a bold move…this thought strikes me. What if he asks us to choose “Whom ye will serve” because he understands well how this will drive all our other choices? Serving someone…even a false god makes me consider something besides myself. Serving ourselves is a dangerous and tricky thing. It’s subtle, but it can kill the very dreams God placed inside us. * Time for God. This one’s huge. satan works hard 24/7 to tear it from my hands. I have to close my door against distractions. The only way I can combat this frustration is to plan meals in advance. * I don’t mind exercise but the only days it actually happens are the days I plan for it on my schedule. And I mean right down to the minute. I can take longer deciding what to wear to exercise than actually exercising. * Laundry……….need I say more? * Quality time with the kids. This one seems like a no-brainer. But it can be more challenging than you think when every kid loves something different and NONE of those somethings are things you overly enjoy doing. * I like the idea of being a great wife. But truthfully it’s because I have a great husband that I’m even still married. Not. Kidding. You get the point. If we are ever to live lives of purpose that produce results we are proud of………we have to choose to. Choices lead to goals which help us make plans that take us where we want to go. It’s not that feelings and emotions are bad. Quite the opposite. They are given to us by a God who feels. We can use our emotion to get the best out of life and help us express ourselves in powerful ways. They were given to us to serve us. We just need to avoid serving them. Choosing is important. Having a made-up mind matters. Keep that in mind this season as the time for making resolutions draws closer. I want you to know the sweetness of a success made on God’s terms. That, my friend, is one that cannot easily be wrestled from your hands. I really want this for me too! I may never control the weather, but by the grace of God goodness it doesn’t get to control me either. It happens every Christmas. I am faced with the same dilemma, what gift will I give my children? I want it to be special, perfect. It isn’t because they expect it but because it gives me great pleasure to see the joy on their faces when I score. First, have my picture taken, and second, shop. By now you’ve guessed that I decided to have my portrait done. So I looked online and found a photographer in Katy. I called her and set up an appointment for her to come to my home. I wanted to make this very special for my kids because my house is for sale, so this will most likely be our last Christmas in the home of 37 years where my kids grew up. Sherry came and decided where we would shoot and offered suggestions about what I should wear. We scheduled the shoot for the following Monday—one week. No problem. I had in mind exactly what I wanted to wear to make the best out of the subject with which she had to work. How hard could it be to find a simple blouse with a collar and 3/4 or long sleeves and a solid deep royal blue color? I had a whole week for heaven’s sake! I prayed before each trip and often during my search. I never lost hope that I would find the “perfect blouse.” I was determined not to settle for less than what I was looking for. It was on the last day, Sunday, after church in about a 2 1/2 hour window after 3 days in 3 cities and 30 stores (that I can count), after driving around the Memorial City Mall for 30 minutes looking for a parking spot (did I mention that I really don’t like to shop?) and walking into the first store, that I SAW IT! Five minutes in the store and I found it! It was perfect, it fit great, and even though by this time I would have paid $500 for it, it was on sale! I was so happy! I was ready for Sherry to take my picture the next morning. I picked them up last Friday, and I can’t wait to see their faces when I give them the framed portrait. In the last week I have been pondering this story that I just related to you. I went on my quest for the “PERFECT GIFT” with zeal, urgency, great desire, perseverance, hope, determination not to “settle”, and a willingness to pay any cost—–all for a blouse. I have begun to seek to know Him with a renewed purpose and desire. At all cost, with perseverance and determination, never settling for less than He has for me, I seek to become all that He created me to be and to know the fullness of joy that is found in an intimate relationship with Him. Jesus is the gift “that keeps on giving” because He wants us to receive all the grace that He offers us. May God bless you and your family in a very special way today. The “experts” were right…all the sappy songs, catch-yourselves-crying Hallmark commercials and tear jerker movies were confirmed….my heart changed that day….and again three years and three days later. I had heard it said, accompanied by sage nods of experience, that having children would forever change your life…and “they” were right. Doug was my “non-sleeper”. After months of having colic, his sleeping habits became altered and ingrained…so that resting was not a top priority for him…and I had to learn to adjust. We spent many nights walking the house…he did not like to be rocked…had to be on the move…always…so we talked….more like I talked…he cried…I cried…we cried together. My husband worked off shore for the first few years of Doug’s life so a bond was forged …a survival pact…that we were both scared…neither having a clue of what to do…but we had each other. By the time I had a loose concept of mothering…as in doing whatever it took each day to not mess things up too badly…I found myself with child again…but tragically lost that life…which left a dark stain on my soul. I wondered…questioned…grieved…and knew my heart would be forever marked by that moment when my world stopped. Life was fragile…..precious… taken for granted at times…and my heart was tender in the cold light of loss. In the busyness of a move….for all we knew…to the unknown… I realized I was pregnant once again…with my precious Mandy…this second piece of Heaven that God would place in my arms. This girl was a sleeper…which has not changed…and that threw me for a while. Many a morning…afternoon…evening…I would find myself watching her breathe…putting a mirror under her nose to catch that fog of life…placing my hand over her chest to check…make sure…she was with me…still. I knew I needed to capture these moments when she was dependent on me…because they are only temporary. ”And when you kissed your little baby, you’ve kissed the face of God”…oh my. I think of Mary spending those nights rocking Jesus to sleep, listening to that sweet cooing sound that only babies can make. Luke 2:19 says….”But Mary treasured up all these tings and pondered them in her heart.” I wonder how tightly she hung onto those moments that slip through your fingers like sand. Did she take extra time to simply gaze at this child…her child…but not really hers. We all realize at a certain point of our parenting years that our children will grow up…and away from us…but nothing like Mary. Perhaps that is why we all revert back to our child-centered memories when Christmas hovers. We remember that precious gift of Jesus the Christ…and gather our own a little closer…for one moment more of wonder. God’s greatest gift came to us in form of a little baby….His grace taking on flesh…so that we would all know Love.. for eternity. Merry Christmas to you all as mine gather and I give thanks to God. Dang it, Elf, you forgot to move…again?? Since there are still nine things on my to-do list, and I need to make at least five more grocery store runs before Christmas Eve, I will get right to the point. What gives you the nerve to be lazy on Day 21 of your 25 day temp job? Your failure to persevere did nothing to improve the 8 year old Dalke’s already-rocky Santa-belief-system. Thanks for that, by the way. You know what I’m talking about…Saturday night? Don’t even tell me you were too tired to move. I know that creative juices can wane towards the end, but really? Cut us some slack, and just move your lanky limbs twelve inches to the left. It doesn’t take acrobatics. Luke doesn’t even care if you’re cool enough to fit in with other toys. He just WANTS YOU TO MOVE. 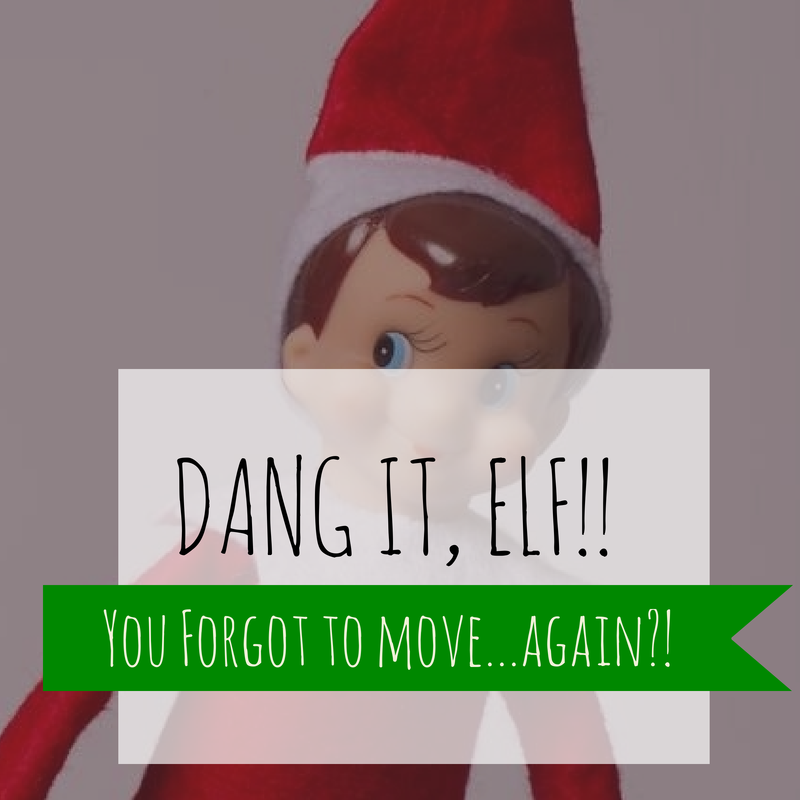 Because when you don’t move, Mr. Elf…well…then we have problems. Kathryn…well, who knows what her most recent weird food thing is. Luke only eats foods with these basic ingredients: pizza, chicken nuggets, and cinnamon toast. Grocery Anxiety was not the only mountain I had to climb yesterday, Mr. Elf. While you stayed in ONE SPOT all day- I was getting dizzy in Hobby Lobby…mentally scrolling through Pinterest DIY feeds…trying to remember exactly what I needed to buy to make Cool Stocking Stuffer History. Meanwhile, I also searched high and low to find something worth $14 dollars, so that Child No. 3 has gifts of equivalent monetary value to Children Nos. 1, 2, and 4. So, dear Elf, if you can no longer fulfill your elf-ly obligations in the Dalke household, perhaps you could be like a Gift Wrapping Fairy instead? Aaah Christmas……It IS a special time, isn’t it? I’m willing to bet that won’t be the winning shot for their Christmas card this year, but it sure was fun to see. So, if you’re reading this Jill…thanks for sharing. I did a little digging to see if I could make Jill feel better by posting some of the best WORST photos my children have taken at Christmas. I noticed two things. The first was that my children took great pictures with Santa (sorry Jill). That is, at least, the children that I took to see Santa. Apparently, by the time baby Jon was born….I could no longer be bothered to get myself to a mall. The second thing I noticed while digging through photo albums was that while the kids loved Santa…they hated the Bunny. That’s strange…I would have thought it would have been the other way around. (Bunnies being so cute and cuddly and all.) Tell you what, you remind me come springtime, and I’ll post those pics to make Jill feel better. I also came across some Christmas photos from my own childhood. These, I paused over. I hadn’t seen them in years. So I let the memories flood back in. The first one is of me. The year was 1975. Kenner had released the doll “Baby Alive” two years prior. I had been begging for at least half that time to own one. This doll was awesome!! Little girls everywhere clamored to have a dolly that you could really feed and diaper. Food could be shoveled down the mouth via spoon or bottle. Then you took care of where it “ended” up with plenty of wipes and oodles of baby powder. Basically, you could clog the thing up from both ends. What you had after awhile was just wrong on about three levels, but man was it fun while it lasted. The second picture made me laugh out loud. This is my brother, Michael David Stone. He’s two years older than me, and I love him with every fiber of my being. In the photo, he too, is receiving a gift that he’d been begging for: a bow and arrow set. He reminds me of the little boy in a movie that would not come out for another 8 years – A Christmas Story. Do you remember everyone telling Ralphie – ”YOU’LL SHOOT YOUR EYE OUT, KID!” Such great expectations. And somehow, the hoping & waiting just made the receiving all that much sweeter. I can’t speak for my brother’s gift, but mine didn’t last very long. I was five. Having good hygiene just for myself was task enough. That doll didn’t stand a chance of not ending up constipated with the funk. As an adult, I view Christmas very differently. I don’t long for things like I did as a kid. I understand now (what no adult could have convinced me of then); things don’t make you happy, fill you up, or satisfy you for very long. Sooner or later they just become heavy burdens that we either try to maintain….or they wind up just getting funky. Our spirits are amazing. Just like our bodies, they have needs and must be maintained. It can be challenging in today’s world to find ways to feed your spirit without compromising your beliefs. As you draw near to God, there is a very real and beautiful exchange that takes place. I know this…God expects us to live expectantly. Not for the latest this world has to offer but for Him. Maybe someday I’ll have the opportunity to write a book called “What to Expect When your Expecting – The Spirit-filled Edition”. That would be pretty funny coming from the girl who couldn’t keep Baby Alive…well…alive. But isn’t that just like God? Constantly redeeming us. So now that you know it’s God’s will………….What are you expecting? Fear is a dangerous thing in our lives and in the body of Christ. In my own life, I have suffered at the grip of fear from as far back as I can remember. The fear of saying or doing the wrong thing; the fear of imposition; fear of being imperfect; the fear of “what are people going to think about me?”; and the really big one: the fear of being the judgmental Christian. All of the aforementioned fears in some way somehow have paralyzed me from being who God has fearfully and wonderfully made me to be. Occasionally, on Thursdays you will catch a post from me, Meredith Pennington. I am married to my best friend Doug, and we have 3 great kiddos…Paul 12, Landen 10, and Ella Bella 8. I truly live for being a mom, but have a passion for decorating, so on any given day, you may find me working on some crazy home project. (Oh, and on a side note, I home school my kiddos.) No, I am not super mom…it is by the grace of God that I get through each and every day. I believe I’m living proof that God will equip and bless you when he calls you to something, i.e., HOMESCHOOLING. Back to this fear thing for moment: I once heard that you could find “Fear Not” in the Bible 365 times, 1 for each day of the year. Although this was comforting to me, this wasn’t exactly correct. According to word nugget.com, there are about 100 combinations of the phrases “do not be afraid” or “fear not”. Easier said than done……I find myself shaking in my boots already, just at the thought of being fearless in all situations. The what-ifs are already creeping into my head…..
What if they really see who I am? What if they are eating dinner when I call? What if my house isn’t always clean? What if, what if, what if….The list goes on and on. The good news is Peter tells us to throw ALL our worry on HIM, because he cares for YOU (1 Peter 5:7). I know, I know, I know, I’m switching gears from fear to worry…and wasn’t Peter warning us in the whole passage about Satan and the powers at be? Yes and Yes, but in my opinion -when we let fear take over, then worry creeps in, and the next thing you know, we have allowed Satan, “the Great Accuser” to map out a plan of attack. On the other hand, if we put both feet on the floor each morning, and consciously remember to put on the full armor of God (Ephesians 6:10-18) – then we are ready to stand firm, rooted in the strength of God for whatever comes are way. Secondly, as we begin to connect as sisters in Christ and spread our root system we will become stronger and stronger, and I truly believe the one who will be shaking in his boots will be the great accuser. WE HAVE THE POWER, SISTERS!!!!!! As we grow as sisters in Christ on this journey I would love to know your fears. What are they? How can we pray for each other?